Home Little England, little Blitz? It often seems that Nigel Farage is fighting the Second World War in his head. In the 2016 referendum he campaigned for British withdrawal from the European Union on a battle bus out of which boomed the march from the Second World War blockbuster The Great Escape. The following year found him thrilling to the film Dunkirk. For Farage, the near-disaster of the British military evacuation from northern France in May 1940 was a story to inspire the heroic new evacuation that is Brexit. Get out and see it, he urged Britain’s youth. This frustrated Spitfire pilot might wax even more evangelical about the Battle of Britain. Yet in this new time of national alarm, it is neither that nor Dunkirk that offers the most fruitful point of reference from 1940. It is what came next – namely the Blitz, the German bombing of London and other British cities that began in September of that year. Some Brexiteers are in no doubt of it. Calling for a new “Blitz spirit”, they appear positively nostalgic for that harrowing episode. It is true that the Blitz tested the mettle of millions – as, albeit in less life-threatening fashion, Brexit yet might. It is also true that it became symbolic of the “people’s war”, the struggle of ordinary British men and women to control their own destiny. But if it haunts the collective imagination, that is chiefly because the Blitz epitomizes the belief that at a decisive moment Britain “stood alone”, the one European nation to defy Hitler in defence of freedom. This notion pervaded the rhetoric of Winston Churchill, who became Prime Minister in May of that year. In reality, even before the United States entered the war, Britain had behind it the resources of a world-wide empire. Nor should it be forgotten that the Battle of Britain was won by Polish, Czech and Commonwealth airmen, as well as British. Yet the least that can be said is that during the Blitz British people mustered a solidarity and resolve that conspicuously elude them now. 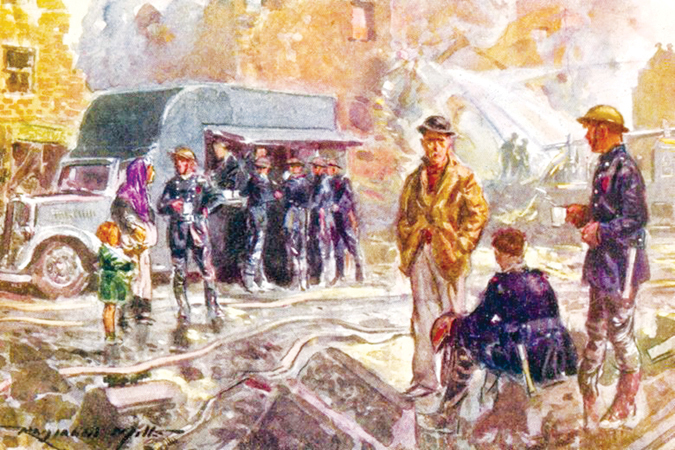 Those qualities found vivid, not to say mythic, expression in the eyewitness accounts of the Blitz by the Scottish journalist Peter Ritchie Calder (1906–82). To read Calder’s books on the subject against the background of Britain’s present strife is a chastening experience. Published in the summer of 1941 when the Blitz was barely over, Carry on London and The Lesson of London raise large questions for 2019 about who the British were and who they have become. What kept British people going when the skies above them portended death and destruction, and the threat of a Nazi invasion was real? And what of the sense of common destiny that brought together England, Scotland, Wales and Northern Ireland, the peoples of the United Kingdom, in a historic act of resistance? Does it still exist? A night time blackout was in force when, in September 1940, Ritchie Calder watched from the roof of a tall building as German fire-bombs set London ablaze. A rising star of left-wing journalism who worked for the New Statesman and the Labour-backing Daily Herald, he reported on the hellishness that Hitler’s airforce was visiting on London’s East End. More than a million children had been evacuated from London and other cities, but the authorities were ill-prepared for tens of thousands being bombed out of their homes. Railing against government dereliction, Calder was accused of “giving comfort to the enemy”. The truth was that official estimates had forecast mass carnage (there was talk of burying the dead in lime pits); homelessness was not going to be the issue. Frantically seeking safety, Londoners stormed Tube stations, to which the government had tried to bar access, fearing they would become “funk holes” that bred panic and defeatism. Calder described refugees from the docklands who occupied church crypts, prising open stone coffins and sleeping with the dead. One night, he witnessed 14,000 men and women swarm into the basement of a vast East End warehouse. Sanitary conditions were dire. In spite of everything London did carry on – though it might not have, but for the attrition suffered by the Luftwaffe in the Battle of Britain. Heavy German losses in daylight dogfights ensured that the bombers arrived mainly at night, making impossible the targeted bombing that might rapidly have smashed the city’s resistance. It also meant that people could go to work with a sense of safety. Absenteeism during the Blitz was uncommon. The slogan “London can take it” (the title of a propaganda film by Humphrey Jennings) appeared on walls round the city. That even devastated areas managed some semblance of normality was thanks to enterprising civilians with a flair for getting things done. One of the heroes of Ritchie Calder’s narrative was a 3 foot 6-high East End optician nicknamed “Micky the Midget”, who turned a chaotic bomb shelter into a model community. Another was Flora Solomon, the chief welfare officer for Marks and Spencer, who harried the British government into taking responsibility for feeding the people. Through her efforts, “field kitchens” sprang up across London. If “red tape”, the scourge of official obstructiveness, figured large in Calder’s story, so did another British speciality: “muddling through”. Calder’s great theme was how, in the teeth of adversity, people were doing things not because they had to but “because they thought they ought to” – even at the cost of their lives. Instances abounded of firemen and others rushing into harm’s way. In the process of gathering material, Calder himself diced with death – though the zest of his reporting suggests that in spite of mortal danger, if not because of it, he was having the time of his life. Among the young and fit, at least, he was perhaps not alone in this. As well as mass fatalities, the government had anticipated mass trauma. Yet what struck Calder was how few individuals broke down. Stiffened by Churchill, who toured bomb sites, mingling tears with bulldog tenacity, public morale was strengthened above all perhaps by shared peril. Calder believed that what also sustained people was the conviction that they were fighting to vanquish not just Hitler but the British status quo, a country blighted by inequality. Wealthy voyeurs who went “slumming” among the bombed-out poor failed to shake Calder’s conviction that the Blitz was dissolving class differences. Roaming among London’s ruins, he brimmed with socialist ardour. An apocalyptic upheaval, he enthused, was “breaking habits that seemed unbreakable”. Casting aside “old reticences and selfishnesses”, the British were “discovering themselves – and each other”. Churchill hailed the heroism of RAF pilots in the Battle of Britain, the few to whom so much was owed by so many; Calder acclaimed the many, without whose resilience the few would have fought in vain. His books on the Blitz are a paean to the common people, to the blow he believed they were striking for a better future. In 1940, the same emotive story was being relayed to the United States by American correspondents in London, of whom there were more than a hundred. Challenging American perceptions of Britain as an imperial nation mired in hierarchical attitudes, the Anglophile broadcasts of Ed Murrow helped to counter American isolationism, the belief that for the United States to enter the war would mean risking American lives in an undeserving cause. Murrow’s message, like Calder’s, was that in the fires of the Blitz an egalitarian new Britain was being forged. The question remains: what would have happened if after nine nerve-shredding months the Blitz had not come to a sudden end? How much endurance had bludgeoned Britons left in them when, in May 1941, in one of history’s most fateful decisions, Hitler redeployed the Luftwaffe on the Eastern Front?